Most people in our community understand that the Editors here like Hong Kong. We love its infrastructure, we appreciate the great hotels, and we’re definitely no stranger to its intense nightlife or amazing shopping. But perhaps our favorite thing about Hong Kong is the people’s obsession with food and how this translates into delicious culinary experiences. On a little side street in Central we’ve had the best Italian pasta we’re ever had (except for that tiny hole in the wall in Umbria, Italy). We’ve enjoyed Argentinean steak and the best empanadas this side of Buenos Aires in Wan Chai and we’ve tasted some of the nicest Bordeaux vintages while watching A Symphony of Lights from the Kowloon side. So we like the culinary scene in Hong Kong. That’s why we’re happy to have a team cover this year’s Wine and Dine Festival. From October 31st until November 4th the American Express Hong Kong Wine & Dine Festival will take over the New Central Harbourfont for 4 days and nights to celebrate the best gastronomy from around the world. 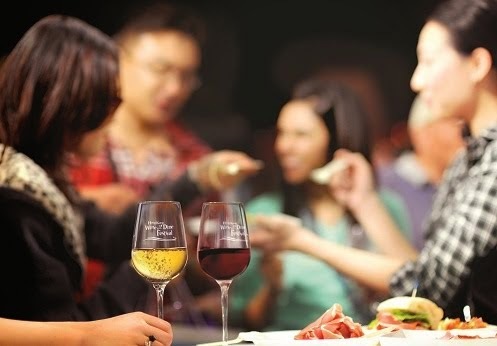 Organized by the Hong Kong Tourism Board, this annual event was named by ForbesTraveler.com as one of the world’s top 10 international food and wine festivals. Last year the Wine & Dine Festival attracted 188,000 people from Hong Kong, Asia and the world who consumed a whopping 32,000 bottles of wine. Clearly this festival shows how Hong Kong, Asia’s World City, has become the epicenter for food, wine and luxury in Asia. This year with a new venue and plans to stage the best event ever, Foodies from across the continent and around the world will converge to sample wines, taste food and share their stories of great chefs and luxury travel. We highly recommend that you move your Asian meetings to the city during this event just so that you can sample the best of the world. But in case you can’t, check out this site and our social media feeds for videos, live blogs and great coverage of the festival.